Pineapple is one of those fruits that is delicious in anything, with anything or just by itself. My entire family loves pineapple so, of course, I could not resist dipping it in melted chocolate and serving it as a snack. 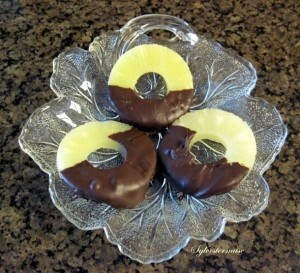 Chocolate Covered or Dipped Pineapple would also be great as an appetizer or as a dessert. 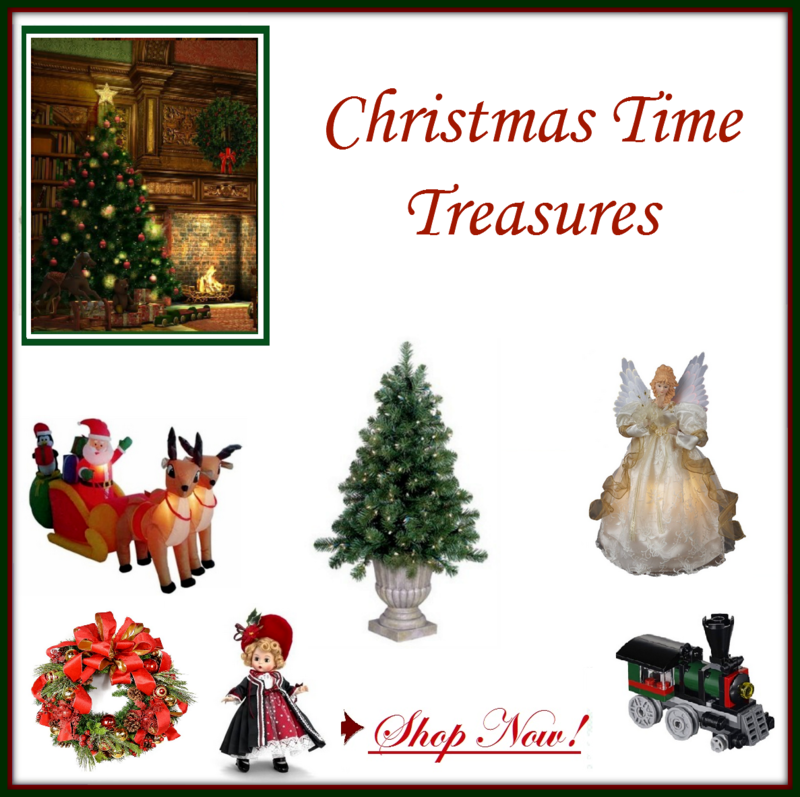 It is so pretty that it would be lovely on a wedding reception table, wedding or baby shower table, or served at an afternoon tea. It is also very easy and quick to make. 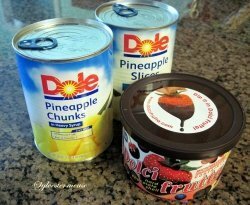 Pineapple ~ Sliced or Chunks ~ Canned or Fresh ~ I used canned fruit in the photos because it is fast and easy. Pineapple Chunks make an especially easy to serve appetizer or snack! 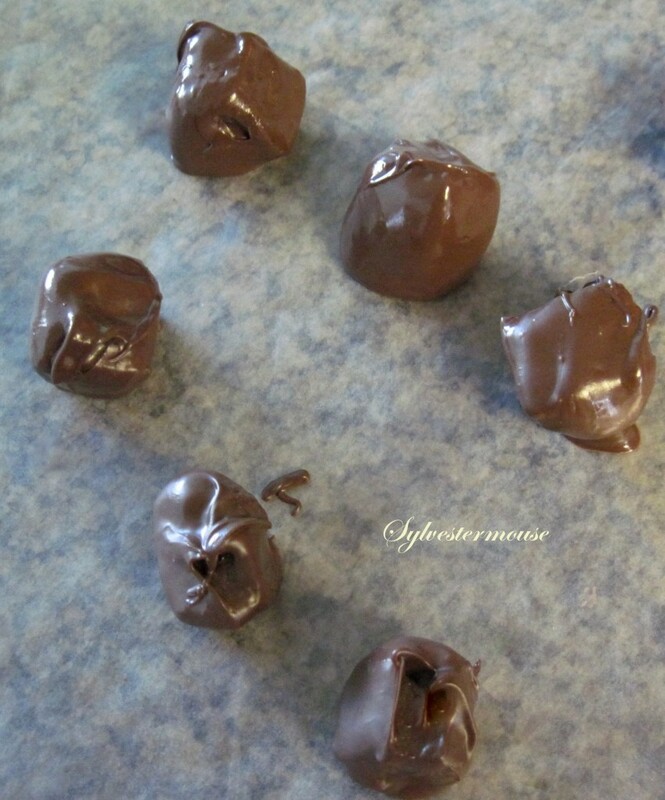 Step 1: Cover a cookie sheet with wax paper ~ The cookie sheet will make it easier to move your Chocolate Covered Fruit. 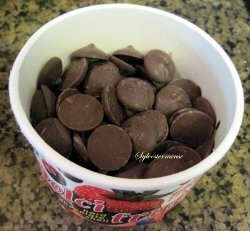 Step 2: Melt Your Chocolate ~ If you use Saco Dolci Frutta, you can melt the chocolate in the microwave in their package container. Melt the chocolate in the microwave for 2 minutes on medium and stir the chocolate until it is completely melted. 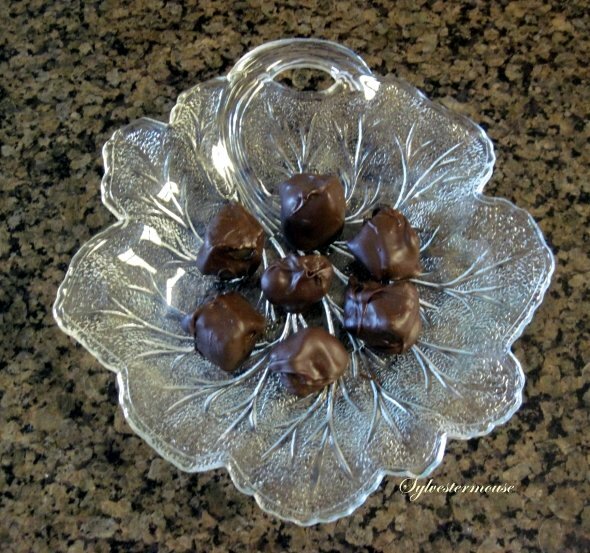 Other chocolates will need to be melted in a double boiler or a microwavable dish. Step 3: If you are using canned fruit, completely drain juice and gently dry pineapple. If you are using fresh pineapple, core and slice it into pieces. Step 6: When you have dipped all of your fruit pieces in chocolate, serve or eat. Coring and slicing a fresh pineapple can be a bit tricky. You might want to treat yourself to a corer. 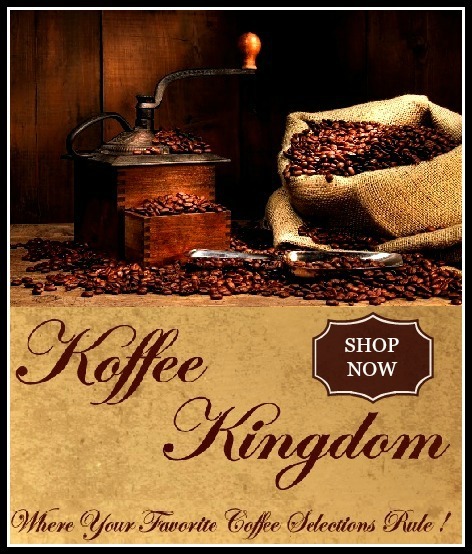 The featured corer below has a ratcheting grip to help your wrist. 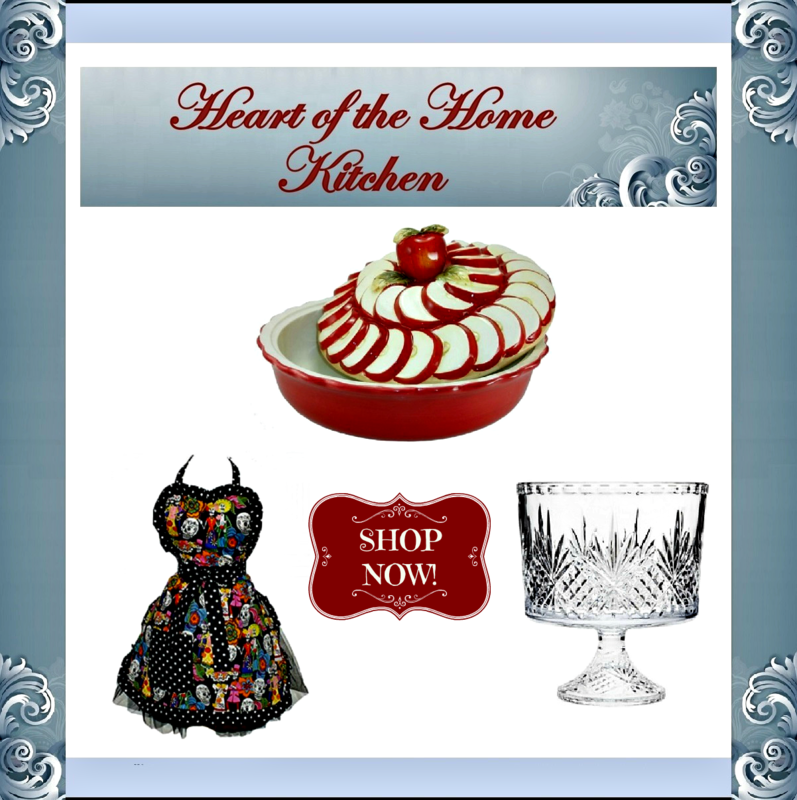 Also, be sure and select a pretty serving tray or dish for your chocolate covered fruit. It will definitely make a lovely presentation at any party. This article was originally published by me in 2010 on a site that is no longer in existence. Since the establishment of Cooking for the Holidays, I am moving all of my favorite recipes to this permanent site. Have you done this with fresh pineapple? Not sure why I’ve never thought of this! Of course I love fresh pineapple and, of course, I love chocolate. Just never thought to put the two together this way. Yum! This looks delicious and, more importantly, easy enough for me!!! Thank you for sharing photos with the steps.